In the past few years, we have seen a rise in Warhammer 40,000 games ranging from strategy games to first person titles and more. A couple of months back, the first action role-playing game set in the universe created by Games Workshop, Warhammer 40,000: Inquisitor – Martyr, released on PC, and this month it finally hit PlayStation 4 and Xbox One. The game developed by Neocore Games comes with an engaging campaign and some interesting features, but the derivative gameplay prevents it from being a truly remarkable title. Warhammer 40,000: Inquisitor – Martyr is set in the 41st millennium, with the galaxy being at constant war. Players will take control of their own custom created Inquisitor, who is sent to investigate the mysterious disappearance of a huge ship, whose inhabitants have become worshippers of Chaos following its reappearance. This is only the beginning, as the investigation takes some twists along the way, become a matter of utmost importance for the whole universe. Warhammer 40,000: Inquisitor – Martyr story is one of the game’s best features. Right from the beginning, the atmosphere is pretty dark, making the game feel almost like a horror title filled with mystery. While the most important events of the story are presented through voice-acted dialogue, players often have to piece together what is happening, something that’s not only incredibly in-line with the role of Inquisitor, but that also makes the campaign quite engaging. Sadly, those who aren’t particularly familiar with the Warhammer 40,000 universe may find themselves a little lost, as the game is deeply connected to the lore of the universe, and knowledge of some of its most important elements is taken for granted. While the story of Warhammer 40,000: Inquisitor – Martyr excels, the gameplay experience is a bit hit and miss, not because it’s broken, but because it isn’t particularly innovative. The main campaign is divided into small missions with different objectives, ranging from investigating specific areas to defending specific objectives and so on. Players usually have to complete missions by themselves, but in some cases, they will be accompanied by other NPCs that can be given some simple orders. Before even getting into the action, players will have to create their own character in a rather simple character creator, where the appearance of the character and his or her class can be chosen. There are three classes available, the Crusader, the Psyker and the Assassin, and the different backgrounds available dictate the playstyle. There are a lot of different combinations and they are all viable, so the game does come with an interesting replay value. The Inquisitor can be further customized with skills, which are learned through the Skill Trees, and Perks, which are unlocked by completing Heroic Deeds. These mechanics are hardly original for action role-playing games in general, but they do get the job done. Once an Inquisitor has been created, players can finally take part in the action. As already mentioned, the actual gameplay experience is extremely derivative, resembling Diablo III a bit too much. The game is played in a top-down view, with players moving around the different areas defeating enemies and collecting items. Players have a lot of options for dealing with the enemy, from the two different attacks for each weapon type to a variety of skills. Enemy types are varied enough, but at the Story difficulty level, everything is so easy that very few enemies will pose a threat. Challenging is definitely harder, maybe too much, so a difficulty level in the middle between Story and Challenging wouldn’t have been too bad. 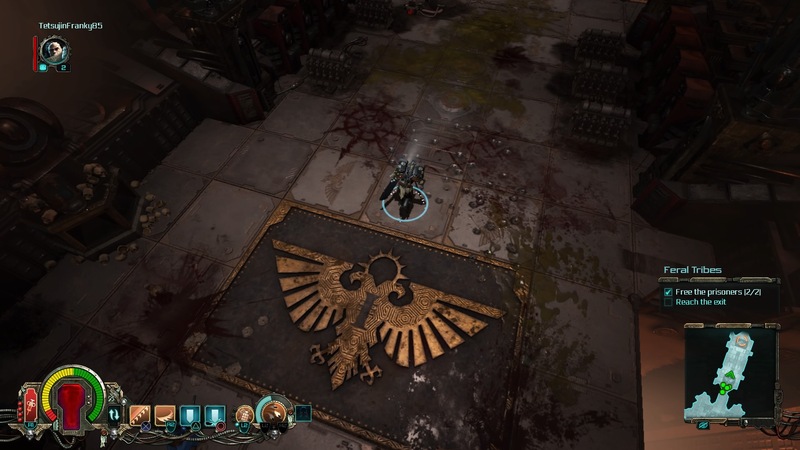 One feature that does set Warhammer 40,000: Inquisitor – Martyr apart from Diablo III and other similar games is the cover system, which allows players to hide behind objects. As most of them are destructible, don’t expect to be able to cover behind them for a long time. What really doesn’t set the game apart from the successful Blizzard action role-playing game, however, is the focus on loot. 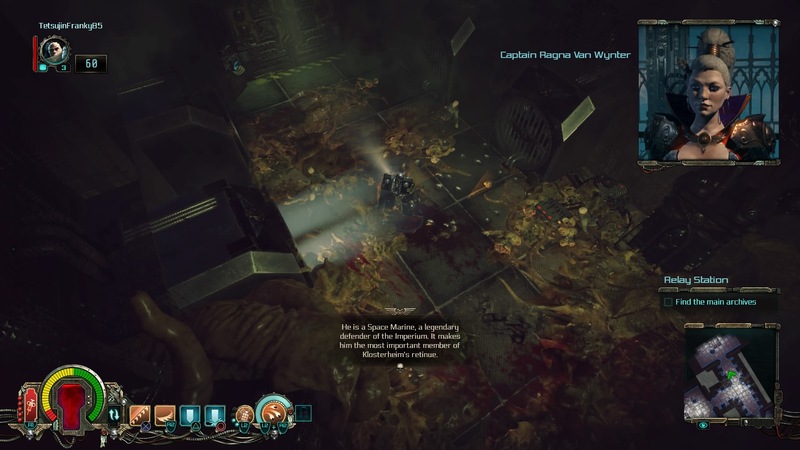 Once the prologue has been completed, Warhammer 40,000: Inquisitor – Martyr opens up considerably, allowing players to travel through the galaxy and complete side-missions, which may be too hard at the beginning due to gear and level requirement. If one has some powerful friends, however, they may try to enlist their help, as it’s possible to tackle any mission in co-op mode, both local and online. The online features are particularly well developed, with the Cabal offering some interesting social features that are in no way required to enjoy the game but that definitely add something more to those who want to enjoy the game with other Warhammer 40,000 fans. The presentation of Warhammer 40,000: Inquisitor – Martyr is a mixed bag. Graphics are decent, if a bit on the grim side, though that is something expected out of a Warhammer 40,000 game, but performance on a regular PlayStation 4 console is all over the place. With just a few enemies on screen, the frame rate becomes extremely unstable and everything starts feeling sluggish. Warhammer 40,000: Inquisitor – Martyr doesn’t require lightning-fast reactions, but drops are distracting nonetheless. Another issue, shared with other recent games, is the font size, which is way too small to be comfortable when playing the game not close to the TV. The soundtrack is also acceptable, and so is voice acting. 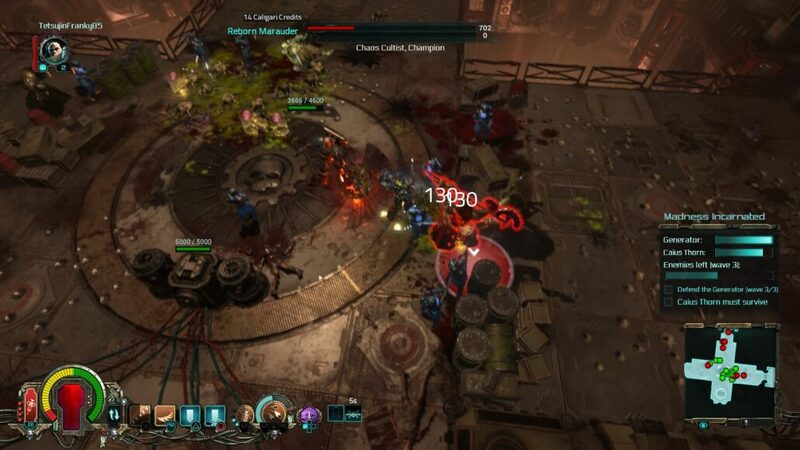 Warhammer 40,000: Inquisitor – Martyr isn’t a bad game by any standard, but it could have been so much more than a Diablo III clone, especially since the campaign is well crafted. Warhammer 40,000 fans will surely love being able to purge the Heretics as an Inquisitor, but everyone else may want to try out the game before purchasing, as the mindless action can prove a little too mindless at times. Reviewed on PlayStation 4 (code provided by the publisher). You can purchase the game on Amazon. Being the first action role-playing game set in the universe created by Games Workshop, Warhammer 40,000: Inquisitor - Martyr is a worthy purchase for fans, with a well-crafted campaign deeply invested in the universe's lore. Sadly, the gameplay experience, while functional, is quite derivative, and the few features setting it apart from other action role-playing games are not enough to make it an essential purchase for those who aren't familiar with the Warhammer 40,000 universe or aren't big action role-playing game fans.